As a college student (or any kind of student), it can be great to earn some extra money. But how do you find a way to do this that can fit into your schedule and without investing any money? As we all more or less have constant access to the internet now, trying to make money online has become a very popular way. There are however many scams out there, that will end up costing you money instead of making you any. Paid surveys for college students (and for any kind of student) are a great, legit and easy way to make some money on the side while studying. In this article, I will show you the best survey sites for students in 2019 and tell you what you can expect from them, how the earning possibilities are, and how you can join, so you can easily find the sites that fit your needs the best. Why paid student surveys are a great way to make extra money! Doing paid surveys does not require any training or any special skills. Anybody can do it. When you are a student, you might not have a lot of extra money to invest. If you have looked into making money online, you will find out that more or less all the suggestions you find will take some kind of investment or high risk. Doing paid student surveys will never cost you anything, as long as you stay away from the scam sites. Surveys can be done whenever it fits into your schedule. And you can always choose which surveys you wish to participate in, and which ones you do not want to do. Some survey sites update their offers throughout the day, so you just check the sites whenever it fits you. Other sites will email you when there is an available survey, but you can just wait to take the survey until you have time. Some even have apps that make it very easy to take surveys on the go. There is no risk involved in doing paid surveys. You are always sure to make a profit, and you will start making a profit from day one. This is quite unique compared to other ways of making money online. Getting paid is, of course, a very good reason to do online surveys, but there are also other reasons to do them. You will be able to have your opinion heard on important topics and that way, for example, be able to influence politics, as well as products and services from companies. As a student, you will have a lot of opportunities available on survey sites. Many companies and organization would like to hear the opinions of students, and therefore there will be quite a lot of available surveys for you on many of the platforms. As you can see, doing paid surveys can have a lot of advantages. But let’s now look deeper into how it works, before we get to the best sites. It is very easy to start earning money by taking paid student surveys. All you have to do is to sign up for the survey sites that are available in your country, and then start taking the surveys (you can see a list of the best sites below). Many survey sites do however also offer other options than paid surveys, so there are often also other ways to earn. It can, for example, be to watch videos, click ads, search the internet, downloading apps, playing games, get cash back on online shopping, free contests, online tasks through Figure Eight (aka CrowdFlower) and more. Using several of these other options on the sites can be a great way to boost your earnings. Also, be aware that survey sites have different offers, so it is a good idea to sign up for several sites to increase the chances of making money. In general, I suggest starting with signing up for 5-6 sites, if you have not done paid surveys before. It will give you a lot of opportunities, and after getting used to how it works, you can expand to more sites. But if you join all the available sites from the beginning, it might be overwhelming and not possible to really learn to get the most out of the platforms. So bookmark this page, so you can come back and see which sites are the best to join – the list is regularly updated, as I test new sites constantly. Before signing up for survey sites, it can be good to know what you can expect to earn from it. It is very difficult to give precise numbers for how much you can earn, as it depends on a number of things like for example where you live, the sites you sign up for, your interests, the time you spent etc. It is however important to know that paid surveys will not make you rich or a full-time income. It is definitely realistic to make for example $200-$1000 per month depending on your activity – especially if you also use some of the other earning opportunities survey sites often offer. So it can be some really nice money on the side while studying. 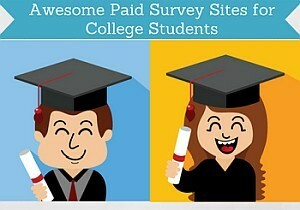 Whether you are a college student or any other kind of student, the survey sites below are some of the best to join. So find the ones that fit you the best and join them to start earning today. Remember that to get the most opportunities and earn the most, you should join several sites, as they all have different opportunities, so it is great to combine them. SwagBucks is one of the biggest and most popular survey sites and online rewards portals. If you are at college or are a student in general, it will for sure have some interesting ways for you to earn. SwagBucks has its own app that makes it easy to earn whenever it fits you. You can earn by doing surveys, search online, watch videos, take online offers, playing games, inviting friends, and it has a great shopping portal, where you can get some great discounts and cashback offers if you like shopping online. SwagBucks is only available in the US, UK, Canada, Australia, Ireland, Germany, Spain, and France, and you can join already from you are 13 years old, so basically any student can join, as long as you live in one of the mentioned countries. You can get paid through PayPal or choose from a big selection of gift cards. If you join through the join button below, you will get a great start with a $5 joining bonus. PineCone is in many ways a unique survey site. It is one of the highest paying survey sites, as you will get a minimum of $3 per survey. You will also get a $3 joining bonus for filling out the welcome survey and thereby get paid right away. It is especially looking for students to join and has a good amount of surveys. There will not be surveys available every day, but because of the high rewards per survey, it gives good opportunities to make some extra money on the side. What makes PineCone really special is that you can only join it through an invitation link, and not just by going to the website. By clicking the join button below, you can find an invitation link, if you live in the US, Canada, UK, France, or Germany, which are the countries PaidFromSurveys at the moment has invitation links for. PrizeRebel is one of my overall favorite survey sites and is definitely a great site with many opportunities if you are a college student. It has a lot of different opportunities to earn. You can earn by taking surveys, do tasks through Figure Eight tasks (aka CrowdFlower), take online offers, it regularly has free promo codes and has some great free contests. You can join PrizeRebel more or less no matter where you live, but there will be most opportunities for English-speaking countries, but it can definitely still be worth joining for other countries as well. You can join when you are 13 years old, but if you are between 13-18 years old, you need consent from your parents or guardians. You can get paid through PayPal or choose from a big selection of gift cards. Toluna is a site that offers a good amount of surveys. Other than doing surveys, you can also at times get free products you can test, and there is a community where you can interact with other members and earn by creating content. A site that is definitely worth considering to join as a student. It is available worldwide and has surveys in the local language. How many opportunities you will have to earn will vary from country to country. You can get paid through PayPal or gift cards. You can join when you are 14 years old, but if you are below 18, your rewards might have to be paid out to a parent or guardian. YouGov is a great survey panel that is easy to use. You will receive an email whenever there is a new survey available, and it also has an app that makes it easy to take surveys on the go. YouGov is especially looking for more young people between 18-34 to join, and therefore there are good chances to earn some money on YouGov if you are a student. The surveys are about interesting topics, and you can even see the results of the surveys they are conducting on their websites, which is not possible on many survey sites. The exact reward you can get depends on the country you live in, but in general, it offers rewards like cash, PayPal, Amazon, gift cards, products, and prepaid visa cards. Definitely a site worth joining. ClixSense is another of my overall favorite survey sites and a great option for any student more or less no matter where in the world you live. The main way to earn is through surveys, but it also has a lot of online offer with great rewards, and if you like to do Figure Eight tasks, ClixSense is probably the best site to do this. It also has a daily bonus you can get, if you have a certain activity in a day. ClixSense is available worldwide and has good opportunities for most countries and you can join from you are 16 years old. You can get paid through Payoneer, Skrill, Dwolla, Tango Card or check. PointClub is a fun and engaging survey site with a decent amount of surveys for college students. It is not the site with the most opportunities, but it is easy to use and the surveys you get there give quite good rewards in relation to the time spent. Especially if you log in regularly as you can then get up to 100% bonus on every survey. The payout threshold is a little higher than on many of the other sites on this list, but you also get a $5 joining bonus which will give you a great start. You can choose to get paid in cash or choose between more than 80 gift cards. GlobalTestMarket offers a pretty good amount of paid surveys, and also has good opportunities for students. It does not offer surveys quite as often as some of the other sites on the list, but it is very user-friendly and does not take much effort to be a member of, so definitely still worth joining. Once you sign up, you will get an email every time there is an available survey, and then you just click the link in the email. It also has an app, where you can get easy access to the surveys. GlobalTestMarket is available in around 50 countries and often in the local language. You can join, when you are 14 years old in most countries, and you can get paid through PayPal, gift cards, or can donate your earnings to charity. Nielsen Computer & Mobile Panel is an easy way to give feedback as a student and earn a bit of extra money this way. It is a panel that collects research about internet behavior and use this to improve online services and products. And the best thing is that you can participate without doing anything actively. You just need to install an app. It is a safe app, and you will remain anonymous, and it can be a great way to earn a bit extra while contributing to important research. You earn cash and get the chance to win really big cash prizes by participating. At the moment Nielsen is only accepting new members from US, UK, Australia, and Germany. FeaturePoints is very easy to use on the go as it has a very user-friendly app, which makes it a perfect site to earn a bit of extra money as a busy student. It offers some surveys, but you should also use some of its other earning options to get the most out of it. You can, for example, earn some nice rewards by downloading apps. It is very quick to reach the payout threshold on FeaturePoints as you can get paid already when you have earned $1. If you join through the link below, you will get 50 points as a welcome bonus. PaidViewpoint is unique, as it is a site, where you will always qualify for the surveys you are offered. At the same time, the surveys are quite short and very easy to answer. In the beginning, it takes a bit of patience, as you have to build up your trust, so at first, you will not get very high rewards. As you build trust, you will start being offered more and better paid surveys. It only has decent opportunities for students in the US, Canada, the UK and to some extent Australia. If you live in one of these countries, it is definitely worth joining even though it does not give very many surveys compared to the other sites, but the ones you get are very short and gives good rewards. If you do not live in one of the mentioned countries, you will not get any real opportunities on PaidViewpoint and should therefore join other sites instead. You can join when you are 18 years old, and you will get paid through PayPal. Superpay.me can in the beginning be a bit confusing to use, but once you get used to it, it gives really good opportunities to earn some extra cash as a student. In addition to earn money by taking surveys, you can also earn by clicking ads, watching videos, take online offers, and it regularly runs free contests with really big cash rewards. Superpay.me is available worldwide, but exactly how many opportunities you will have varies from country to country. What is really great about Superpay.me is the very low payout threshold, and you can get paid already when you have earned $1, which you can do very fast. You can get paid through PayPal, Skrill, or Bitcoin. Opinion Outpost is a survey panel that is very easy to use, as you just sign up and then you will receive a survey invitation when there is a new survey available. In addition to taking surveys, you will also automatically participate in the quarterly prize draw as an active member. Here you can win some great prizes if you are lucky. You can for example in the US win prizes for $10,000 every quarter and in the UK £5,000. The payout threshold is low as you can get your earning out already when you have earned $5. You can choose to get paid in cash or gift cards. The best thing about SurveyRewardz is the simplicity of the site, which makes it very easy to use. You can only earn by taking surveys, but when you take a survey on the site, it scans and find available surveys to you. Sometimes it can take a bit of time to find an available survey, but for students, it offers a good amount, so there are good chances to find surveys here. In theory, you can join the site from most countries, but it only gives really good opportunities, if you live in the US, Canada, UK, or Australia. SurveyRewardz has a great low payout threshold, which means you can get paid through PayPal already when you have earned $1. You can also get paid by check, virtual Visa, or gift cards – for these rewards the payout threshold is $5. Survey Junkie is available in the US, UK, Australia, and Canada and it is very easy to use. Once you join, you can log in and see what surveys are available. In addition to this, you can at times get access to focus groups, phone interviews, and product testing. These options are a great way to make some extra cash as a student as they do not require much work and pay quite well for the time. So if you get some of these extra options offered, you should definitely consider. You can get paid in cash through PayPal on Survey Junkie and you can get your earnings once you have earned $10. InstaGC is available in most countries, but the amount of opportunities vary from country to country. In general it has good opportunities for students. You can for example earn by taking surveys, downloading apps, doing Figure Eight tasks, inviting friends to join, and bet on sports games. It has many opportunities, but in the beginning, it can take a little time to figure out how to use the platform in the best way. InstaGC is another of the sites, where it is possible to earn enough for a payout very quickly, as the payout threshold is only $1. You can choose to get paid through PayPal, gift cards, or donate your earnings to charity. Vindale Research is another user-friendly survey panel. It mainly offers surveys as a way to earn, but you can also watch videos, invite friends, and more. At times, Vindale offers some really high paying surveys. If you get an invitation for these, you have to act quickly as they fill up quickly. But they can really be worth participating in. You cannot get paid until you have earned $50, so make sure to try to get the high paying surveys as it otherwise can take some patience to reach the payout threshold. Viewfruit is, first of all, a survey site but you can also interact with other members on the site, and every time you take a survey, you also get a chance to participate in the lucky draw for great prizes. Be aware that there will most likely be quite a few surveys you do not qualify for. There are, however, many relevant surveys for college students so you should find a good amount of opportunities. And you will also get a small reward for the surveys you do not qualify for. The payout threshold is only $5 and you can get paid in cash through PayPal. The Panel Station is actually mostly a survey app, so it is another of the survey panels that make it easy to earn on the go. You can sign up on the website, but to get access to most of the surveys, you will need their app as well. It will not give you surveys every day, but as an extra survey site, it can be great to join. You can get paid in cash through PayPal or you can get gift cards depending on your preferences. The payout threshold is only $5. Cinchbucks has several ways to earn and you can, for example, earn by taking surveys, watching videos, take offers, by inviting friends, and more. At first, it can be a bit confusing to use so you just have to be a bit patient at the beginning. If you use the paid offers, make sure to read the conditions as some of them are not really worth it and others can give some nice earnings. The payout threshold on Cinchbucks is $10, and you can get paid through PayPal, in Bitcoin, or in gift cards. CashCrate is a bit of an outsider for me. I like the site because it has good potential, and it also has good potential for students, but it can also take some patience to get to know it and get the most out of it. If you are a bit patient, CashCrate has a decent amount of surveys, online offers, you can earn by playing games, and it regularly has free events or contests, where you can get some great bonuses. You can sign up no matter where you live. It does, however, have the most opportunities for the US, but also good opportunities for Canada, UK, Australia, Germany, and France. But you can still find some opportunities if you come from different countries, but it takes even more patience. You have to be at least 13 years old to join, and you can get paid through PayPal or check. Green Panthera is available in 30 countries, and it has several daily opportunities to earn on paid surveys, and it has a pretty good amount of surveys for students. The disadvantage of Green Panthera is that you will often have to click many surveys to find the ones you qualify for, compared to other survey sites. But with a little patience, it can be worth joining. In addition to earning by taking surveys, Green Panthera has online offers, you can download apps, or get cash back on shopping, however, surveys that are the best way to earn here. The platform has a pretty high payout threshold, as you have to earn $30, before you can get paid. The payout method is PayPal. Mobrog has specific survey sites for many countries in the local language. It offers a decent amount of relevant surveys for students in most of these countries. Compared to some of the other sites on this list, it does not offer quite as many opportunities, and it can take some patience to find the surveys you qualify for. As it is easy to use, as you just have to sign up and will then receive email invitations for surveys, it can still be worth joining as an extra site. In addition to paid surveys, Mobrog sometimes announces free contests on their social media channels. You can get paid through PayPal or Skrill and the payout threshold is around $7 (depending on the country you live in). EarningStation is only open for US residents, so it is only relevant for you if you are a student living in the US. The site has a decent amount of paid surveys, and you can also earn by taking online offers, watching videos, get coupons, and more. The site is very easy-to-use and easy to get started with. No matter how you like to get paid, you can find a good way on EarningStation, as it offers many payout methods. You can, for example, get paid through PayPal, Amazon e-certificates, virtual Visa, and choose between many gift cards as well. You can get paid when you have earned $10. TimeBucks is an interesting site that has some quite unusual offers. You can of course earn by doing surveys, but you can also earn by viewing online content, watching videos, growing a beard, taking selfies, mining, and more. As a student, it might not be the site that has the biggest rewards, and it can take a bit of patience, but because of its unusual and varied offers, you will always find something you can make money on there. TimeBucks is available for all countries, you can join when you are 18 years old, and you can get paid through PayPal or Bitcoins. There you have it – a list of some great survey sites, if you are a college student or any other kind of student. This is not a complete list of all the sites that are available if you are studying, but it is a list of the sites with the best opportunities, so it is the best sites to join to start earning quickly. The list will regularly be updated with new opportunities, so bookmark this page and come back and check once in a while for new opportunities. If you have any questions, comments or know a site that you think belongs on this list, I would love to hear from you in a comment below. I’m a person who feels that doing lots of surveys are a waste of my time that’s why I usually choose what I do. And these are usually free and voluntary. But reading your post , I learned that there’s a lot of opportunities out there especially for students who need extra money. I’m sure this is really helpful for them to earn extra cash. Nice post. Very thorough and helpful. Thanks for your comment Marita. If you find the right survey sites, they can be a really great way to make some nice extra cash on the side. But if you are looking for a full-time income, they are not the way to go. So whether they are worth it or not depends or lot on your motivation to take them. Make money with surveys is a good option if you have a lot of free time. In order to make good cash, you have to spend a lot of time and effort. I say this because I’ve been involved with this kind of income opportunities for the past 2 months and I only have earned 50 bucks, not to mention the amount of time I needed to earn that amount of money. 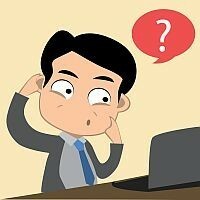 I’m looking for a legit opportunity to make money online in the long-term, do you have any suggestion? Thanks for sharing your experiences Frank. The quality of survey sites really vary a lot, and how much you can make also depends a lot on where in the world you live, so sounds like you have not been too lucky with the sites you have joined, or that you live a place where there are not too many opportunities. But no matter what, surveys are not a way to make a living. There are some legit opportunities to do this online. As I regularly get this question, I have written an article about how to start an online business that you can check out, if you want to know more. I have to say that I have tried a lot of survey sites and pay to websites before and the one that I have stuck to for a number of years is Clixsense. I am not too keen on doing the tasks or offers but the surveys are good. There are usually a few available to complete every day. Online surveys are a nice way to earn a little bit of extra income and it is nice that it is free. If you have the time available then you have nothing to lose. I don’t usually have much spare time anymore otherwise I would spend more time completing surveys. Thanks for the in-depth information on all of these companies. Thanks for sharing your experiences Lynne. I definitely agree that ClixSense is a great and easy site. It is also one of my favorite sites. Like you, I mainly do surveys on it, but some of the offers can be really great as well. The tasks take a bit of patience in the beginning, but in the long run, they can make good money – especially because ClixSense has great bonuses for them.